Presidio is one of the founding Auxiliary Units and was once comprised of young mothers from the Presidio and Mission Hills neighborhoods interested in contributing to the health and wellbeing of children in San Diego. Today the Unit is Presidio only in name, as members hail from all over the city. Several women are second generation Presidio members and over the years have seen traditions ranging from creating Raggedy Anne Dolls and Stick Horses for fundraisers, members bringing a salad ingredient to each meeting to be shared with the group, monthly potlucks, bus trip events and more. 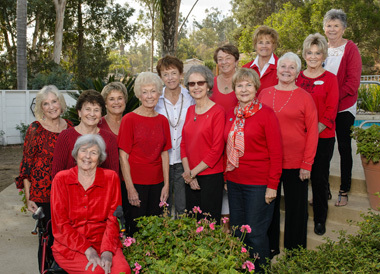 Today the tight-knit unit meets on the third Wednesday morning of each month at a member’s home and their current fundraiser is the Chico’s Fashion Show held at the Coronado Golf Club. Presidio members are particularly dedicated to the monthly Auxiliary education seminars and derive great enjoyment from learning about the miracles that happen each day at Rady Children’s Hospital.